The first Yangtze River Delta Museum Education Exposition opened to the public at the city's World Expo Museum in Huangpu District over the weekend. 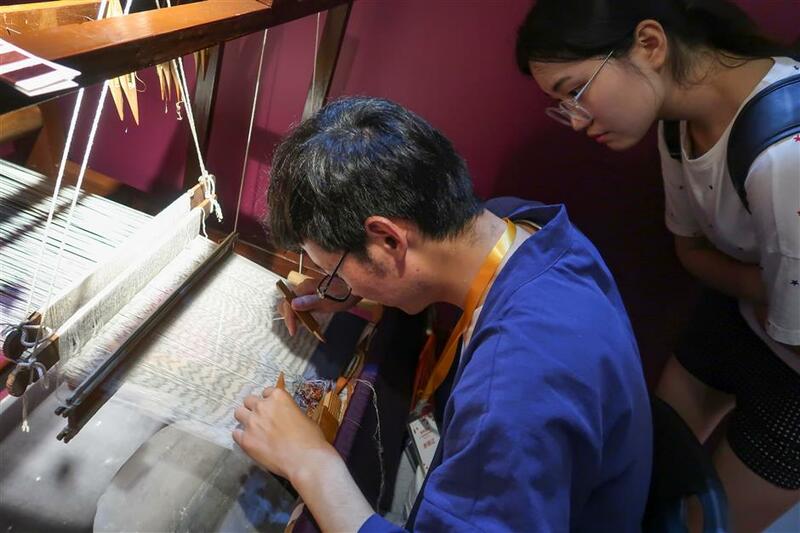 A visitor watches as a Shanghai Museum worker shows how to make kesi, a patterned silk tapestry, at the Yangtze River Delta Museum Education Exposition. The first Yangtze River Delta Museum Education Exposition opened to the public at the city’s World Expo Museum in Huangpu District over the weekend. With the theme “Exploration to Knowledge and Excellence,” it brings in museums from throughout the Delta and has them each showcase their own regional culture, history and traditional skills. The exhibition ends tomorrow. One of the most eye-catching contributions is from the Shanghai Museum. Following the story in a picture book made by the museum, visitors enjoy traditional handicraft skills including Lan Yin Hua, or blue floral print on cloth, bamboo-weaving, embroidery, woodcut New Year paintings, Suzhou fan-making and Jingdezhen porcelain art. The story is about designer A Kun who received packages of traditional Chinese handicrafts from a stranger called Xiao Lu after he moved into a new home. The letters tell him that Xiao traveled to many places in the country and sent the things she found to the home-owner, who has already died. These mysterious packages triggered his curiosity and prompted him to travel to the some of the places in the hope of meeting Xiao, which he eventually does. Visitors can follow the two characters' steps and see the real objects mentioned in the book at the booth, and even how they were made. They can also watch how to make kesi, a patterned silk tapestry, on a wooden loom. The story raises the concept of "Yi Jiang," or artisan, and discusses the meaning of antique and modern handicraft skills and looks at the future. Another of the museum’s displays is models of ancient buildings. The 12 models and the stories behind them show ancient times and highlight heritage protection and inheritance. Wang Keda, a Peking University student who helped create the display, told Shanghai Daily that it's a circulating exhibition initiated in 2012. The team visited the sites of the structures to collect detailed information about them. "I feel the structures, made of wood and bricks thousands of years ago, can tell us stories and touch people," Wang said. "I hope these things can be delivered to more people. They are not only about the structures themselves, but the history and people behind them." "I've been to Shanxi Province and visited the two old temples there. So today I came here (to see the models)," said a female visitor, surnamed Li. "Here, I can feel the things of history, humanism and the spirit of ancient Chinese can be passed on to me." In another display, Yangzhou Museum brought a pool used to make traditional Xuan raw rice paper so visitors could try making paper themselves. "It's a global trend that people are starting to know that museums are not only places for learning in seriousness, but somewhere they enjoy and have fun," said Yang Zhigang, the curator of the Shanghai Museum.